The ColorMaker String receiver is a radio receiver much like our line of RGBAW fixtures but we convert the signal into a data stream that the LED string can decode. Our receiver also generate a constant 12 Volt supply for accurate brightness and colors throughout the display. The LED strings can be connected end to end or use one of our splitter or Y connectors to add drops to the display. Both the PX5-String-75w and PX5-String-35w send control data for up to 200 nodes but will be limited to LED string style and brightness you run the display. 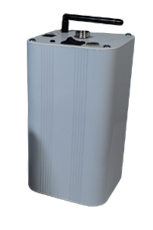 The receivers monitor the current and warning indicator will flash when exceeded and automatically power down if string maximum current is reached. 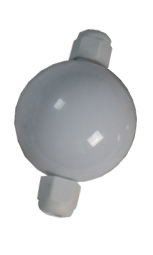 All the function such as ColorRoll and scenes found in our PX5 series fixtures can be used with the String Receivers. The LED stri ngs are digitally controlled and require both power and data through a 4 wire system. The ColorMaker String receivers are coded for most WS2811 and UC9203 chip controller found in most LED strings on the market if you choose to design your own string display. Receiver can be easily mounted using any eyelet or truss clamp with 1/4-20 threaded bolt. The back of the receiver has block with 1/4-20 threaded hole. 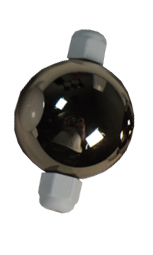 We also offer Magnetic cup for application that weigh less than 4 pounds. LED strings are connected to receiver through a 4 pin connector which is secured by a retaining screw shell. The screw shell connector is enough to hold up to 40 globe strings without the need for additional support. 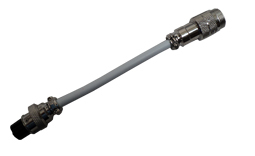 For applications with more weight the receiver has 2 additional 6-32 threaded holes to use eyelets or hooks. These supports will hold up to 15 pounds. ColorMaker offers a line of LED strings that are superior to those on the market. 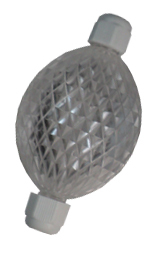 We use 6 LEDS for each node (globe) to prevent shadowing and offer the flexibility to change globe style for each event. 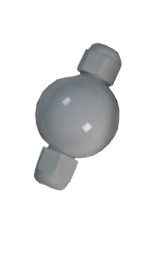 Simply unscrew the two end nuts from each side of the globe and the globe will separate All our globe styles use the same end nuts so its simply just that easy. There are left and right haves for each globe and globes are joined together with a small groove so they fit together and are very sturdy. 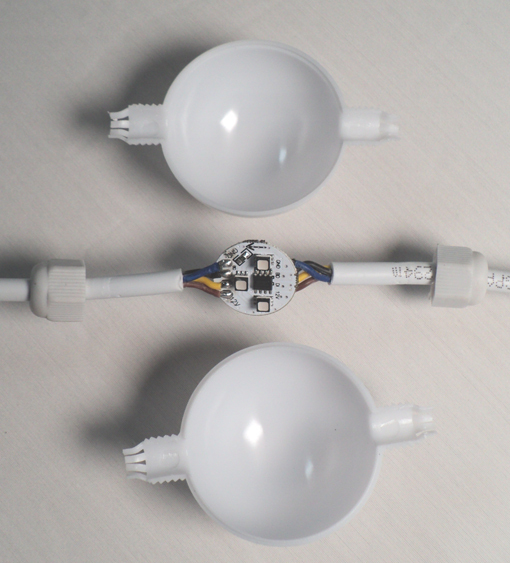 LED strings can be connected together from end to end or use a T drop connector for multiple drops which eliminated the need to loop bottom to top. When connecting end to end a maximum of 40 nodes can be connected and up to 200 node using T drops. We offer Several string in 2 types. 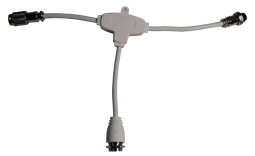 Extension strings have connector at both ends 1 male for input and 1 female connector out to connect the next string. Both standard and extension strings are offered in 10 and 20 globe string lengths. Custom size strings are also available contact us for more details. 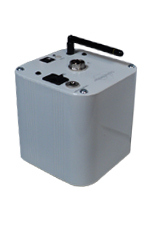 The PX5- receiver can control up to 200 nodes. You can get creative with your display by adding drops and extension cables at any part of the LED string. You should keep the string length below 175 feet total and position the receiver as close to the string input for best control. We offer extension cables at 5,10 and 20 feet but any size can be custom made to fit your needs. ColorMaker String Receivers are compatible with all ColorMaker remote controls at ranges +400 feet. We communicate with receivers with a radio frequency on 916 MHz which is an isolated radio band and will not be affected by WIFI or other wireless devices. No line of sight is required our powerful radio can transmit through wall and all our products are FCC certified for use in the USA. We offer both hand held wands and DMX interface controls. 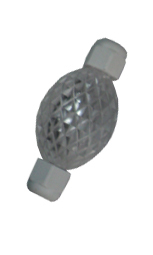 Fixtures can be easily set to receive on any one of 32 channels by a press of a button. See Auto Addressing feature below. Our communication data is all digital and built in data error checking for reliable control. All controls can be set with a unique user code to prevent other Colormaker users in range from controlling your fixtures.